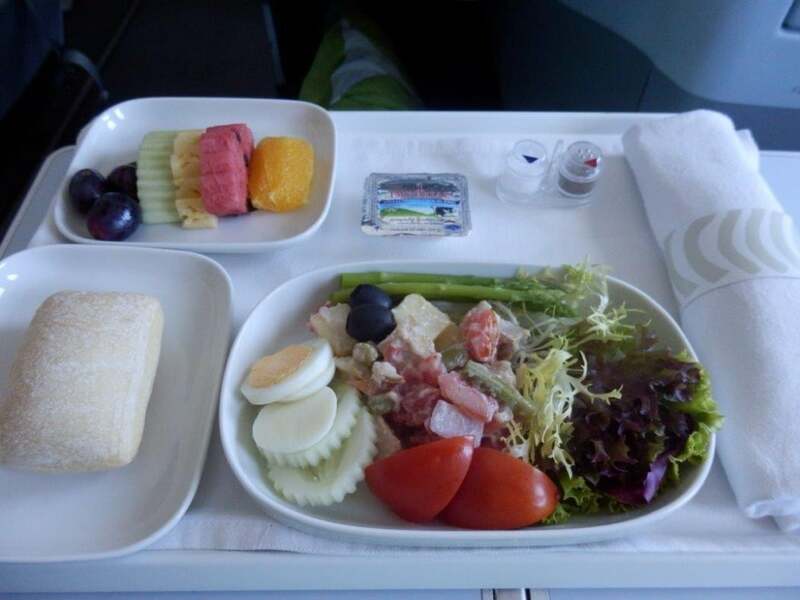 In this trip report, I review Business Class in a Finnair Airbus A330-300 from Bangkok Suvarnabhumi Aiport (BKK) in Thailand to Helsinki Vantaa Airport (HEL) in Finland. Finnair, which is part of the Oneworld Alliance and one of the world´s oldest operating airlines (established in 1923), is one of my preferred European airlines to/from Asia, since flying via Helsinki means that you are flying the shorter and faster route between Asia and Europe. 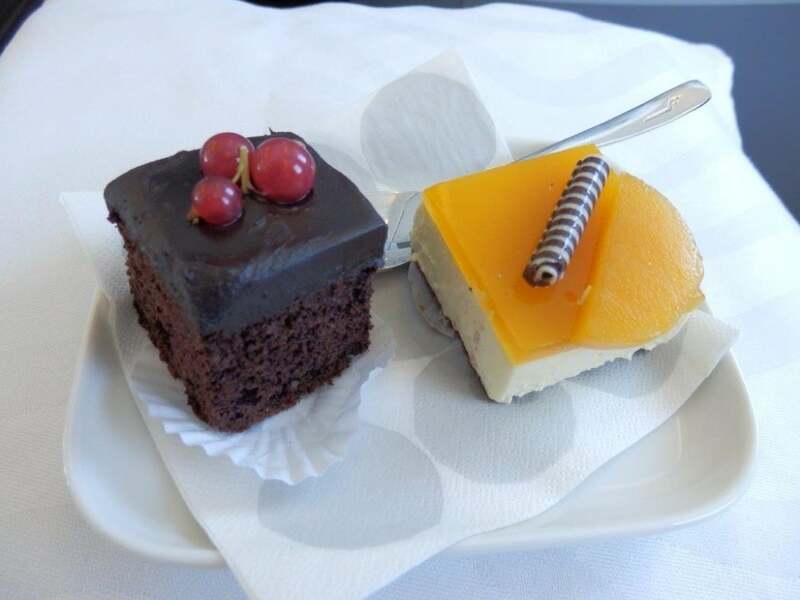 While the airline is not as large as Europe’s 3 leading carriers (Lufthansa, British Airways, and KLM-Air France), it offers a flight experience that is far superior in terms of onboard service. 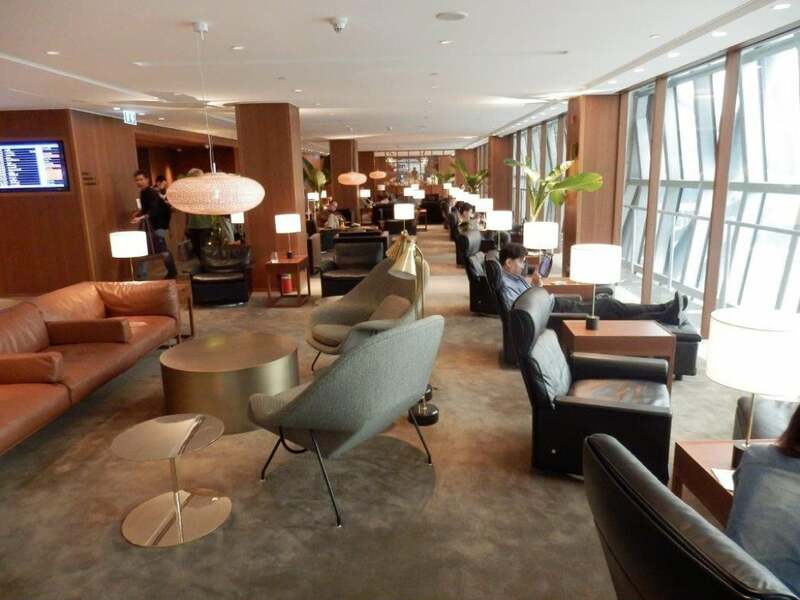 Since Finnair does not have its own lounge at Bangkok Suvarnabhumi Aiport, it gives it Business Class passengers complimentary access to the Cathay Pacific lounge, located at level 3 in the Concourse G departure hall (close to Finnair’s departure gate). I loved the design of this lounge. Warm, natural materials, artwork, designer furniture and soft lighting create a relaxing ambience. There are nice views of runway and the room is bathed in natural light. 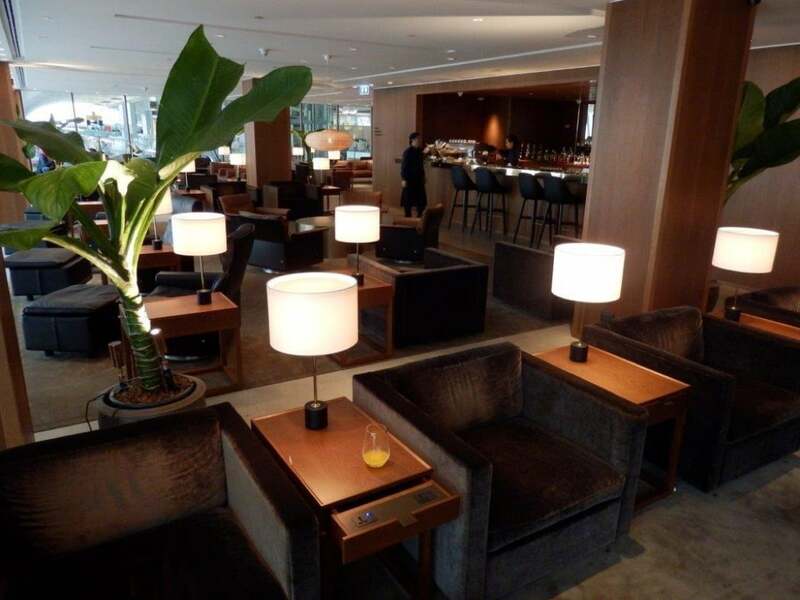 The lounge has a dining area which features Cathay Pacific’s signature ‘The Noodle Bar’, a popular attraction in the airline’s flagship lounges at Hong Kong International Airport. I was at the lounge in the morning, and The Noodle Bar offered a selection of Asian noodles (including wonton noodle soup and tom yam soup freshly prepared by a chef) as well as an authentic Thai breakfast. There was also a second dining space (‘The Food Bar’), with stand-up dining tables and a decent selection of salads, pastries and desserts. In addition, western breakfast items (such as muffins, cold meats and cheese). Freshly blended cocktails and a variety of non-alcoholic drinks were served at the Bar. 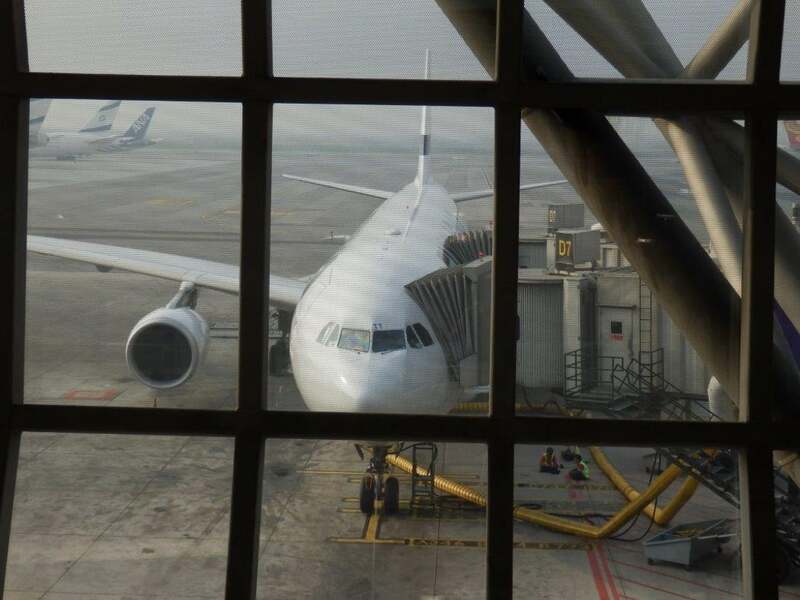 From the lounge, it was a 5 minute stroll to gate D7 where the Airbus A330-300 was ready for boarding. 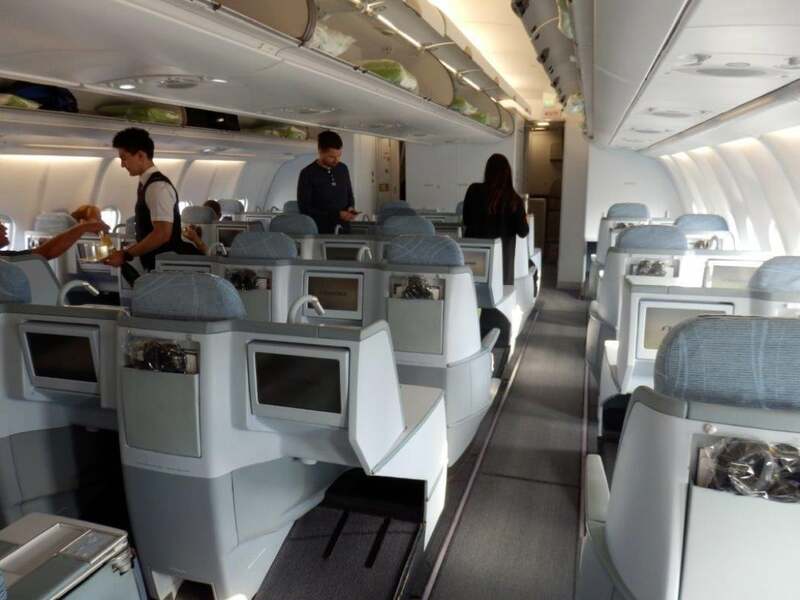 Finnair’s Airbus A330s come in 3 layout versions, and on this particular occasion, the 32 Business Class seats were spread over 7 rows in just one cabin. The Business Class seats were placed in a staggered configuration, a so-called Sogerma Solstys layout, whereby the foot compartment for each seat is located between and under the seats in front. The same layout can be found on Brussels Airlines’ A330, Austrian Airlines’ B777, SWISS’ Airbus A330/A340, Delta’s B767, and American’s B767. The staggered Business Class cabin configuration on Finnair comprises 10 single seats, while the remaining 22 seats come in pairs. All seats enjoy a lot of privacy, as none of the rows quite line up. 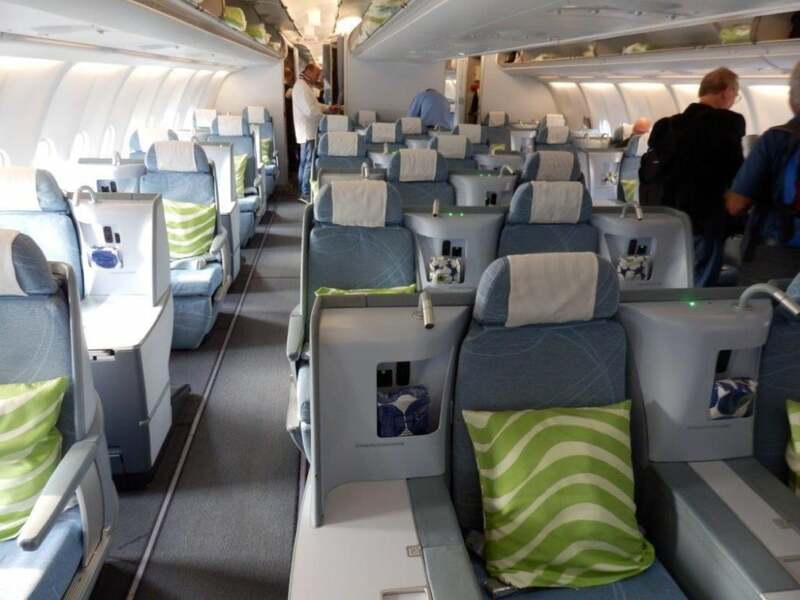 The design of the Business Class cabin itself looks fresh, airy and quite trendy with a predominantly soft blue colour scheme and some subtle greens. All Business Class seats have the same characteristics: 152 cm (60 inches) in pitch, a width of 53 cm (21 inch), and a 180 degree recline. All seats have at least one large work surface on the side, with some seats featuring this work space on both sides (a so-called ‘throne seat’). Within that work surface, you will find the seat controls to adjust the seat position (from take-off position to fully flat). You can also adjust the seat cushion and activate the seat’s integrated massage function. On the side of the seat, there’s a power port with international adapters and a personal reading lamp. In front of the seat, you will find a large entertainment screen, with the foot compartment below. The seat is comfortable when you are sitting upright, but in its lie-flat position your lower legs) descend into a space carved out of the seat in front, below your entertainment screen. This foot compartment is quite small, making it hard to switch position during your sleep, as your legs will constantly hit the walls (seats without the ‘throne’ feature have a little more space for the feet, hence making for a more comfortable sleep). In addition, in its lie flat position, the seat is low, just 45 cm (17 inch) above the floor, making it quite uncomfortable getting into and out to of. This is not even close to Finnair’s Airbus A350 in terms of comfort. 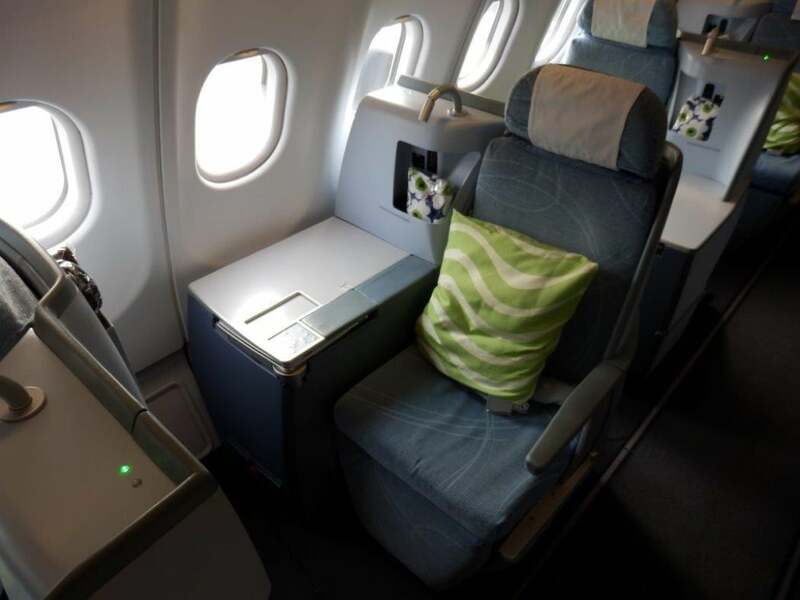 The best seats for solo travellers on this Finnair Airbus A330s are the single seats. Single throne seats offer more space (but are less comfortable for sleeping) and can be found in positions 2A, 4A, and 6A. Travel companions should go for the paired, middle seats, which all have direct aisle access. There are also paired window seats in rows 1, 3, 5 and 7, but here the passenger in the window seat will have to jump over his/her neighbour’s feet to get access to aisle. 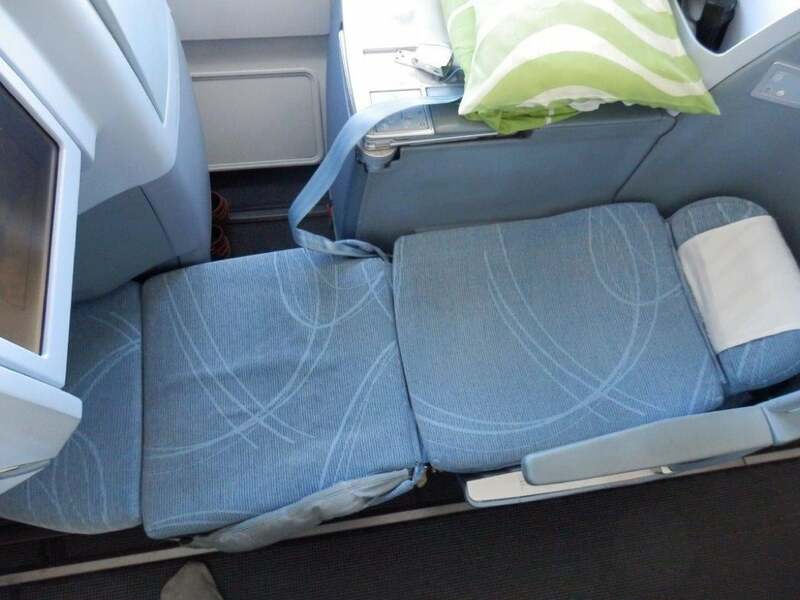 The worst Business Class seats on Finnair’s Airbus A330s are in row 1 since the proximity to the galley may be bothersome, and other flyers tend to bump into these seats when they return from the lavatory. Also avoid the window seats in row 7, since they don’t have a window. 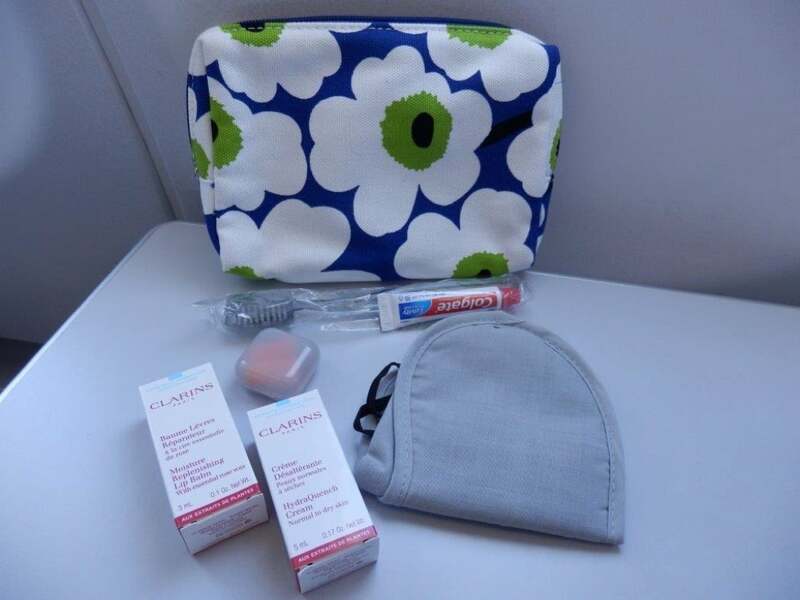 Amenities included a green blanket, a lovely green pillow, noise cancelling headphones, and an amenity kit featuring distinctive Marimekko prints and containing essentials including an eye shade, toothbrush and toothpaste, and Clarins moisturizer and lip balm. Socks, shaving kit, earplugs, mouthwash, hairbrush. Before takeoff, I was offered a choice of welcome drinks: orange juice, water, or Champagne. Dinner service started about 30 minutes after takeoff. The amuse bouche was mozzarella and cherry tomato with pesto. As a starter, I choose the smoked salmon with cocktail sauce and rocket salad. As a main course, I had the beef burgundy, roasted potato wedges, and steamed vegetables, which tasted good but not excellent. Dessert was a collection of petit fours. 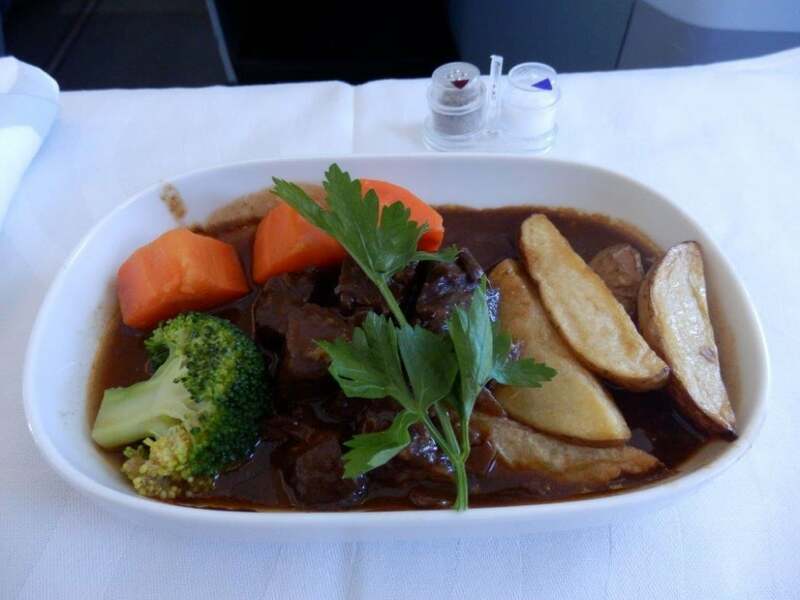 90 minutes prior to landing, a light snack was served. I choose the salad nicoise with grilled tuna, which was good but not great. In front of the Business Class seat, there was a 15 inches (38 centimetres) entertainment screen which could be skewed and adjusted in brightness. The entertainment program itself was great, with a large collection of movies and TV programs. The cameras installed in the nose and belly of the Airbus also offered some fun moments, especially during take-off and landing. Finnair’ crew members – with their chic navy blue designer outfits – are amongst the best and most friendly in the industry, and it was no different on this flight. The plane also had a small walk-up bar, where Business Class fliers could graze between meals. There was a selection of sandwiches, pastries, yoghurt, ice cream, fruit, and/or a chocolate. 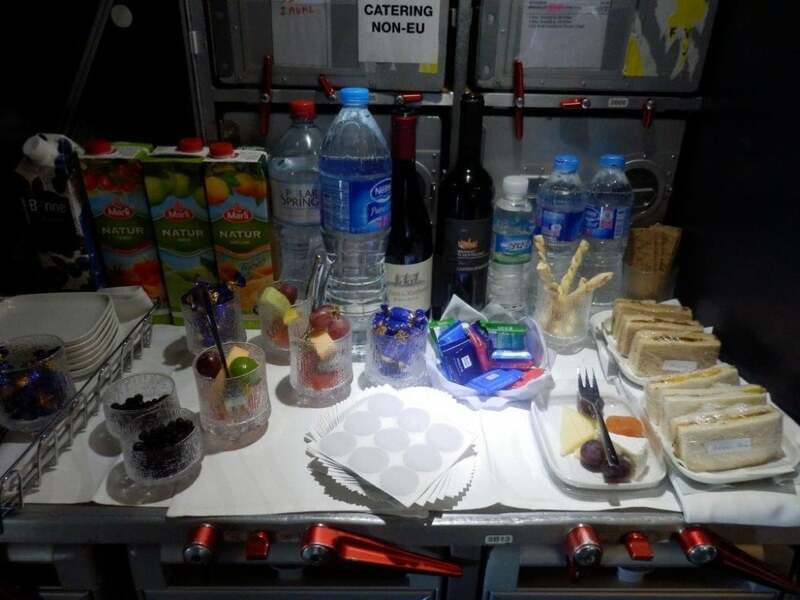 Throughout the flight, the bar was kept fully stocked. 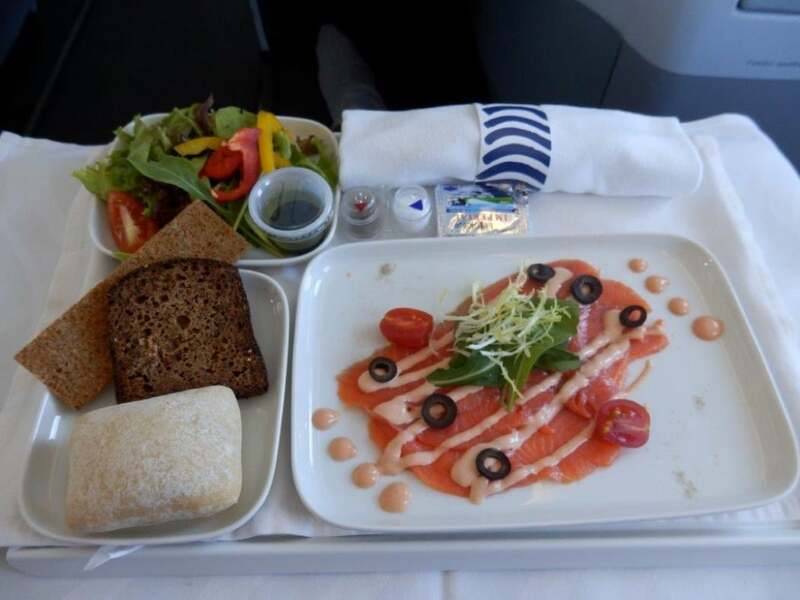 Read more Finnair long haul Business Class flight reviews.